LVIV, Ukraine -- UEFA has insisted there are "absolutely no plans" to drop any of the Ukrainian cities set to host the Euro 2012 tournament despite mounting concerns over preparations. 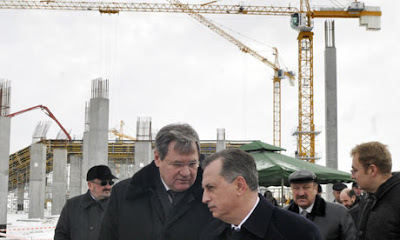 Borys Kolesnikov, vice-prime minister of Ukraine, right, talks with officials as he visits the construction site of a new stadium in Lviv being built for Euro 2012. Ukraine's family, youth and sports minister, Ravil Safiullin, fuelled fears over the weekend by admitting that stadium construction work in Kiev, earmarked to stage the final of the tournament, is five months behind schedule. But a UEFA spokesman told the Press Association that Safiullin had been "really pessimistic" and organisers were still working towards an even split of the eight designated competition venues across the joint hosts, Ukraine and Poland. However, he admitted hurdles need to be overcome in Wroclaw and Lviv in Ukraine. "There are absolutely no plans to drop any of the cities but it is true we have some delays in Wroclaw and Lviv," the spokesman said. "We are not really worried about Wroclaw. Things need to move a bit quicker in Lviv because they also have had some trouble with the financing. "There has also been a visit there from the new vice-prime minister of Ukraine just five days after he was appointed and I think they understand that they need to do it now. "At the moment there are some issues but we are not considering the option of dropping any of the cities. There is no time frame for any such decision to be made because at the moment it is four [in Poland] plus four [in Ukraine], with eight stadiums." The spokesman also said there are no plans to move the Euro 2012 final away from Kiev, although UEFA is sending specialists to look at the progress being made in the city tomorrow.